what is the right age to get your child a cell phone? I wish there was an easy answer to this, like…at age 18, your child must have a cell phone. Unfortunately there isn’t. My oldest son is only 8 years old and this question is already crossing my mind. On one hand, a cell phone provides a sense of security that you can reach them whenever you need to. On the flip side, knowing cyber bullying is more common these days than physical bullying, technology like cell phones make it so frightening in ways that our parents could have never imagined when raising us. Every family raises their children in their own way and one way is not better over another. When it comes to cell phones, I think it’s really dependent on your child and how you think they would be able to handle the responsibility that comes with having one. According to some recent research, on average, a child gets his or her first smartphone around the age of 10. 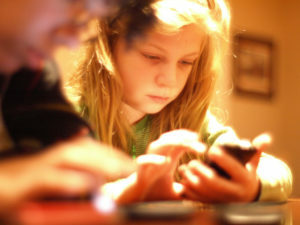 That study also showed that by age 12, a full 50% of children have social media accounts. Bill Gates gave his children a phone at age 14. There are a lot of changes when it comes to technology. It is hard for people to keep up, but it revolves around everyone’s lives- whether they like it or not. From university students through to people who have been serving in the forces can look into something like cybersecurity scholarships to apply for. You can look into various opportunities this field may bring. It’s all about moving forward and embracing. There is no right age to get your child a cell phone. Does your child NEED to be in touch for safety reasons OR just social reasons? Does your child need something that gives their location information, knowing it may be available to strangers also? Can your child be trusted with it at school? Will you be able to manage the security and use of your child’s phone? What will you do to ensure that? Do you know how to stop your ISP tracking your child? Everyone at school has one and your child is feeling left out. This is their life…social media, technology and online presence. It’s the way the world IS and we as parents have to acknowledge that. That doesn’t mean we buy them a cell phone as soon as they want one, but remember who your child is and what they care capable of and use that judgement to help you, rather than just an age. Be open with them as to why they can or can’t have one and talk to them about why you as parents may not be ready. Take an online cyber bullying class together as a family, it will help open up the lines of communication before you as a family make the decision. Think about the functionality/practicality of the phone. Do you leave your child at practices or places when you are not there? Places where you don’t have other parents you know that well that would watch over your child like your own? Many families have situations like this due to their working life, family life or for some other reason. Think about YOUR family and if this decision would help from a safety perspective but knowing you will have restrictions in place to monitor the use. Phones can get quite expensive! Finding a cheap wireless plan can also be pretty annoying. I have friends who recommend Petro Canada Mobility so you could try them. Hold off on the bells and whistles. Give them a basic smart phone and look for apps you can download to monitor their location and usage. If you are okay with your child getting on social media, create an account that you have access to as well. As you start trusting them more, continue to let them be more independent. « why this is us…is really us.